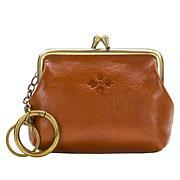 As timeless as the places you take it, this compact, wallet-style wristlet is a sleek companion for any ensemble. Crafted in genuine luxe leather with high-fashion, artisan details, it's just the right size to carry all the essentials without weighing you down. 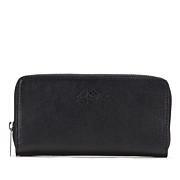 This wristlet/wallet is an organizational wonder. 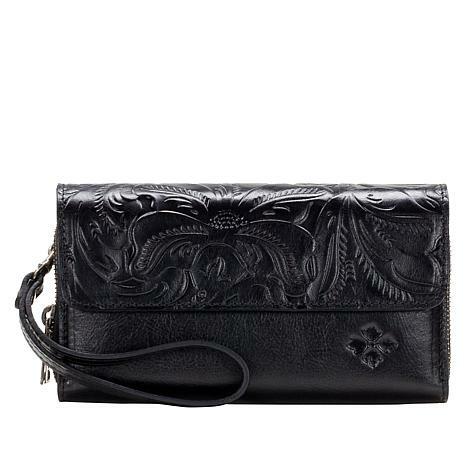 It is LARGE, but is still sized as more of a wallet than a clutch. 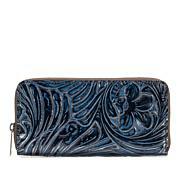 It has all of the features that a wallet needs for coins, bills and cards with ample space. On top of that the back empty section is the perfect organizational file for my coupons, gift cards, and all of those things that get left behind when switching bags. Now when the wallet is transferred, all of those loose receipts, coupons and cards are transferred too. It's a beauty too! 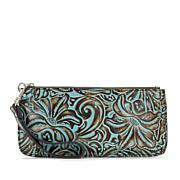 This double zip-around wristlet/wallet is excellent & very high quality! Fits my phone, readers & everything I need when wanting to scale down what I'm carrying & when I go on cruises I always carry a wristlet when on board not wanting to lug around the larger bag & this will be perfect! I love my purchase! Thank you Patricia!!! Very beautiful wallet regret return, but magnets need to be stronger to weak.